Bulgaria and Germany will not have the chance of playing in the 2013 FIBA Europe U18 European Championship Division A after crashing out in the qualifying round. Both teams went perfect in the preliminary round but failed to win a game in the qualifying round like all the other teams from the groups of five. Belarus, England, Hungary and Portugal are the semi-finalists and three from the four teams will be in Division A next year. Belarus ended any chance of Germany qualifying from Group F by beating them (89-74). 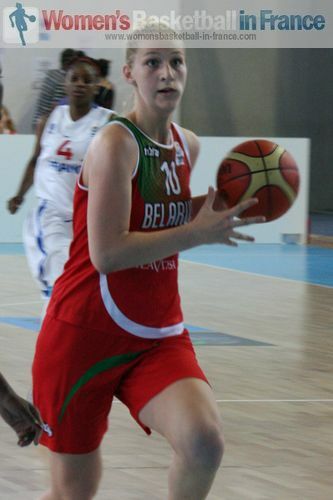 Maryia Papova (in picture) was the match winner for Belarus with a double double of 23 points and 12 rebounds. Germany needing a victory, had the worst possible start to the game by conceding the first 12 points of the game and losing the first quarter (9-22). It was not until early in the final quarter when they reduced their deficit to 6 points (63-69) and threatening their opponents' control over the match. However this was as close as they got. With Germany's defeat, England's semi-final place was assured before they took the court to play Lithuania. The English duo of Cheridene Green (16 points and 13 rebounds) and Shequila Joseph (18 points) did most of damage in England's victory (62-52) . In Group E, Hungary had a long wait to know if they had qualified for the semi-final or not after beating Denmark (63-47) as the last match of the day was still to come. Portugal maintained their perfect record in this competition with a hard fought victory over Bulgaria (60-55). The two teams were still locked together with 25 minutes played (38-38). Portugal finally broke the deadlock to take the lead for good with a three-pointer by Joana Soeiro. Although Bulgaria never regained the advantage the score remained close right up to the final buzzer. In the lower classification games played in Group G, Finland beat Austria (56-53) while Israel defeated Switzerland (58-42). In Group H, Latvia cruised past Ukraine (66-40) while the hosts Macedonia beat Scotland (66-59).